The information presented on this page was originally released on April 5, 2012. It may not be outdated, but please search our site for more current information. If you plan to quote or reference this information in a publication, please check with the Extension specialist or author before proceeding. Tidwell said the irony of osteoporosis is that while it is considered a disease that impacts only older people, diet and physical activity in one’s younger years can greatly effect to bone health. Proper nutrition and exercise habits can benefit both short- and long-term health in many ways, including building strong bones, maintaining weight, improving cardiovascular health and preventing diseases. “If you’ve built up good bones as a young adult, your chances of developing osteoporosis are low,” Tidwell said. “Nutritionally, dairy products, fortified cereals, green leafy vegetables and cold water fish such as salmon all contain calcium, a key component to building healthy bones. “Vitamin D is the second key factor in bone health, because it helps the body absorb calcium. Sunlight helps your body produce vitamin D, and most experts say 10 to 15 minutes of exposure to sunlight, before 11 a.m. and after 3 p.m., three to four times per week is a good way to get vitamin D,” she said. Risk factors for the disease include causes beyond an individual’s control, such as genetics, specifically the maternal family history of the disease and ethnicity. Caucasians, Asians and Hispanics are at a higher risk than African Americans or those of African heritage, Tidwell said. Stress, certain medications and being small-framed also play a role. But many of the factors depend on individual choice. “Smoking and overuse of alcohol are risk factors, as both interfere with bone development,” she said. “Being sedentary, a long-term diet inadequate in calcium and vitamin D, and estrogen deficiency all decrease bone health. “The eating disorder anorexia nervosa sets up a person for malnutrition and poor bone health. People who are not taking in enough nutrients to build up their bone mass will lose calcium faster than others. Not everyone will develop osteoporosis, but all elderly people experience some bone loss. Early nutritional choices influence bone loss later in life,” she said. Tidwell said weight-bearing exercise is very important for building up healthy bones. Beverly Brimer, an MSU employee, discovered the challenges of living with osteoporosis after she fell over a year ago. Brimer described herself as being known for a healthy lifestyle that included walking, hiking and nutritious meals and excluded smoking and drinking alcohol. But after her diagnosis, she studied what could help her rebuild her bones as much as possible, and she revolutionized her diet and lifestyle. 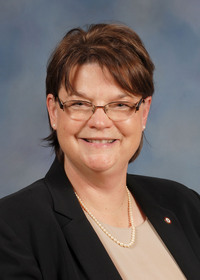 Brimer’s research has led her to be passionate about educating others about osteoporosis. “I tell people, ‘You’d better start making deposits into your health bank account early!’ You build the majority of your bone by the time you’re in your 20s. You want to have a nice supply of bone strength before you start to lose it. Invest in your health, especially when you’re young, because you’ll appreciate it when you get older,” she said. Looking back, Brimer said she wishes she had trusted her instincts more and gotten a second opinion.